Photo of: North of Ireland: Antrim: Giant's Causeway. This image of a section of the Giant's Causeway was taken on a calm morning in late spring. At other times the North Atlantic crashes onto the pillars. 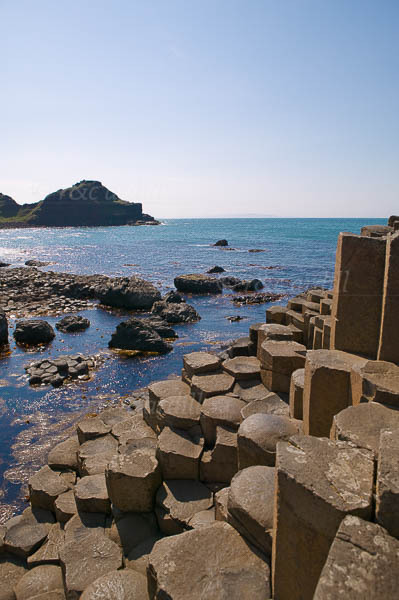 The Giant's Causeway is the jewel in the crown of the North Antrim Coast. It is a World Heritage site and is therefore ranked alongside Mount Everest and the Giant Redwoods of California for its importance to humankind. Volcanic activity helped Finn Mc Cool forge this wonder of the World some 60 Million years ago.